There comes a time in everyone's life when they find themselves addicted to seaplanes. Well, maybe not. But there should be. My addiction only reared its ugly head while in my early twenties, after I first saw Miyazaki Hayao's classic animated movie, Porco Rosso (known in Japanese or kurenai no buta). 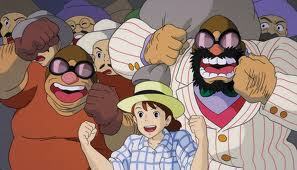 Porco Rosso has not made the greatest cultural impact of Studio Ghibli films, nor is it Miyazaki Hayao's best story. 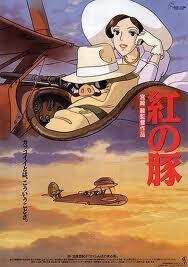 Nonetheless, it remains to this day my favorite Miyazaki Hayao film. 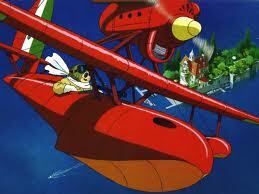 Porco Rosso centers on the story of a flying pig, a seaplane ace formerly known as Marco Pagot. An ex-fighter ace of World War I Italy formerly known for his great moral character, Marco now lives alone on a desert island. He makes his living as a freelance mercenary, for hire to combat the rampant air piracy in the Adriatic. He uses ammunition to fight air pirates, but makes it his policy never to kill anyone. Although the story is told in a very subtle manner, Porco Rosso seems to be a retelling of the frog prince, albeit set against the backdrop of seaplanes, piracy, and the rise of Fascist Italy in the 1920s Adriatic Sea. 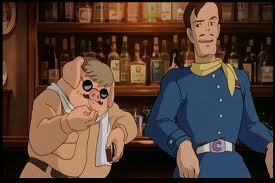 In years past, while a World War I fighter ace, the handsome young Marco Pagot turned into a pig. This was no mere curse; instead, it is more likely that he abandoned his own humanity due to his experiences as a fighter-ace in World War I. Before the war, Marco had the opportunity to choose between love for woman (who happened to be a wartime enemy) and love for country. He chose the latter, and went to fight for Italy in World War I as an ace pilot. His wartime trauma and suffering, however, led Marco to abandon his humanity. This adult-oriented drama and action adventure deals with, in a light and roundabout way, real life events. It is a story about reclaiming humanity, overcoming self-hatred, and perhaps even recognizing true love (the beautiful Gina). His meeting with Fio, the talented 17 year-old American seaplane designer, starts him on the path toward reclaiming his humanity and overcoming his self-hatred. Does he shed his inner pig? Is he able to find love again? A character-driven love story and tale of adventure, Porco Rosso features such iconic characters as Gina, the beautiful owner of the famous Hotel Adriano; the young and vibrant Fio; the American pilot Donald Curtis, a man with ambition for fame, glory, and the hand of a beautiful maiden he would be proud to introduce to his mother; and the air pirate Mamma Aiuto, a rough, tough, greedy, and smelly pirate who also possesses a warm, softhearted side. This is not a children's movie. It is, instead, a must see for adult nerds of all shapes and sizes. But please, please watch it subtitled!!!! Bonuses: +1 for well-designed, detailed seaplanes. +1 for loveable pirates, even more loveable hostages, and leaving the ending ambiguous. +1 for the iconic line, "a pig who can't fly is just a pig." Penalties: -1 for the at-times-annoying caricature of wild west America. Otherwise, this movie is filled with nerd awesomeness.